Procedural actions for revision of pension of pre-1.1.2016 retirees of Central Government in pursuance of the OM of Department of Pension and Pensioners’ Welfare dated 12.5.2017 – Regarding. New Delhi: The Ministries/Departments of the Central Government are aware of the orders issued by Department of Pension and Pensioners’ Welfare (DoP&PW) contained in their OM No. 38/37/2016-P&PW(A) dated 12.5.2017 regarding revision of pension of pre-1.1.2016 retirees. In terms of para 4 thereof, the revised pension/family pension w.e.f. 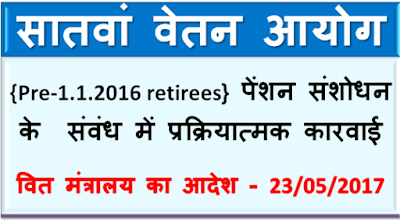 1.1.2016 in respect of all Central civil pensioners/family pensioners, including CAPF’s who retired/died prior to 1.1.2016 may be revised by notionally fixing their pay in the pay matrix recommended by the 7th Central Pay Commission in the level corresponding to the pay in the pay scale/pay band and grade pay at which they retired/died. The said OM further provides that this will be done by notional pay fixation under each intervening Pay Commission based on the formula for revision of pay. 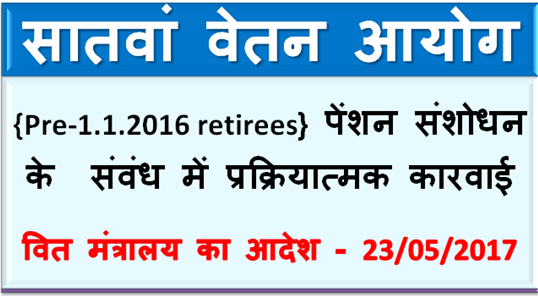 50% of the notional pay as on 1.1.2016 shall be the revised pension and 30% of this notional pay shall be the revised family pension w.e.f. 1.1.2016. The Ministries/Departments are aware that actual implementation of the aforesaid order contained in the OM dated 12.5.2017 of the Department of Pension and Pensioners’ Welfare involves a procedure for revision of pension of such pensioners, which covers a number of agencies like the Heads of Departments/Heads of Offices, under whose administrative control a particular pensioner had worked before retirement/death, the concerned PAOs, pension accounting organizations like CPAO in case of civil pensioners and similar pension accounting organizations pertaining to pensioners in Ministries of Railways, Defence and Department of Posts, etc. Therefore, a coordinated action amongst these agencies is required to ensure that revision of pension in such cases is processed expeditiously. Accordingly, while the substantive matter pertaining to revision of pension of pre-1.1.2016 Central Government retirees concerns Department of Pension and Pensioners’ Welfare as already provided in their aforesaid OM dated 12.5.2017 and any further substantive order thereon issued by them, there are certain procedural actions which need to be taken by the concerned administrative agencies in each Ministry/Department as well as the pension accounting organisations like the Central Pension Accounting Office under the Ministry of Finance, Department of Expenditure; Controller General of Defence Accounts under the Ministry of Defence and similar pension accounting organisations under the Ministry of Railways and Department of Posts etc so that appropriate implementation of the orders of Department of Pension and Pensioners’ Welfare as per their OM dated 12.5.2017 is carried out expeditiously.